Classy apps for classy people. 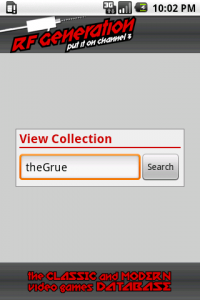 Comments Off on RFGeneration App for Android – Beta 1! RFGeneration App for Android – Beta 1! 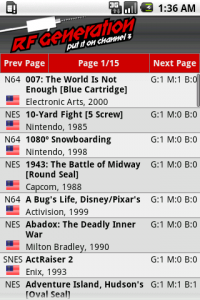 For the past two months or so, I've been working on an Android app so I can easily look up what games are in my collection while I'm at a game store, flea market, or yard sale. If you've got a big collection, sometimes it's easy to forget whether you've got something already! For the first public beta release, I wanted to really nail the task of browsing through your collection quickly and effectively. It works well for my collection, but does it work well for yours? Hopefully it will, but if it doesn't, I'll do what I can to fix your problem and get a new beta version out quickly. Once we get all the problems fixed, this can go onto the Android market for everybody to download! 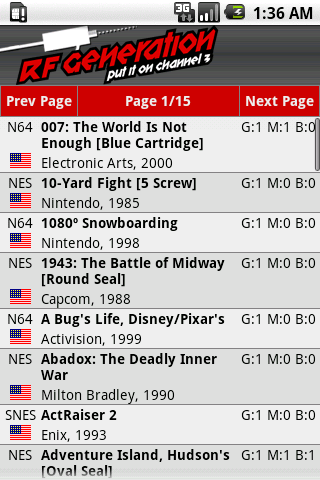 Thus far I've only been able to test on the Android emulator, as well as my G1 running Froyo. The app should run fine on any Android version 1.5 (Cupcake) and above, but I haven't personally tested it on each version. Every Android phone currently on the market also has a much bigger screen than my G1, so hopefully everything scales well for bigger phones. Ready to check it out? Here's the download link! If you've never loaded a non-market app before, first make sure your phone is configured to allow installation from non-Market sources by going to Settings -> Applications and checking the "Unknown sources" box. Then, simply e-mail the above file to your phone, open it up, and click the "Install" button to install it. Feel free to suggest things, too. Hope everybody enjoys the app! Josh Gruenberg likes to collect video games and write applications about collecting video games. Video Game Price Charts App now available on Android Market! 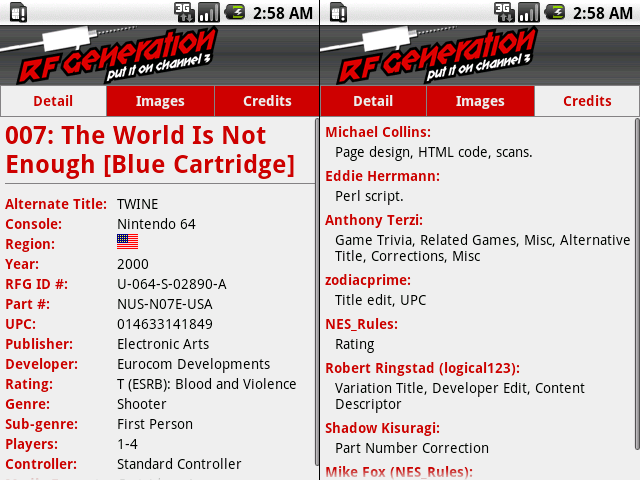 RF Generation App now available on Android Market!